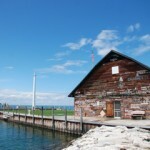 This iconic dock is quintessential Door County. Play on its lush green grass, drop a line off the deep end, and even leave your legacy on the barn’s clapboard exterior! 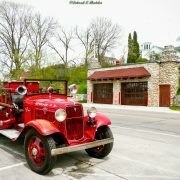 Named for the historic firehouse built into the hill just across the highway, Firehouse Dock and Marina is Ephraim’s primary marina, with both permanent and transient boat slips available. For slip rental information, contact the Village Office at 920-854-5501. Widely considered to be Wisconsin’s most complete state park, Peninsula is jam-packed with unique opportunities to explore, including Eagle Tower, Eagle Bluff Lighthouse, Peninsula State Park Golf Course, Nicolet Beach, and miles of hiking and biking trails. By land or by sea, Peninsula State Park has it all. 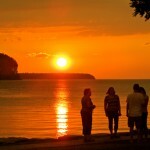 Ephraim’s public shoreline is a great spot to sit and relax, and offers one of Door County’s best sunset locations. Watch the sun dip down between the bluffs of Peninsula State Park and Horseshoe Island, and hope for just the right amount of clouds. While much of Door County is identified by rocky shores, the unique geography of Eagle Harbor creates wonderfully sandy spot on the south end of the village, and the Ephraim Public Beach is accessible to all. Sit and soak in the sun, or swim in its shallow waters. Complete with restrooms, foot wash, and a drink machine (and plenty of sand), the Ephraim Beach has everything you could need. A short network of trails will lead you through a regenerating wetland ecosystem, as you navigate across wooden bridges and over streams and ponds that swell with the seasons. 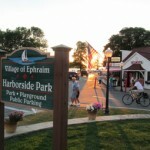 Ephraim’s downtown hillside park features playground equipment, benches and a gazebo, where Ephraim hosts its annual Evenings in Ephraim concert series. Concerts run from late June through August, from 6-8pm. 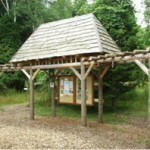 Just a block from Water Street (Hwy 42), Moravia Street hides a Door County Land Trust property that is not to be missed. 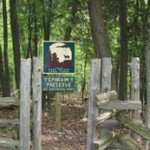 Trails loop through fields of juniper and along the bluffs of the Niagara Escarpment while circumnavigating Anderson Pond. A prime birding location, this mile-long loop is a hotspot for waterfowl.